Alabama might not be the first place you think of when you envision beautiful white sand beaches in the United States, but if you haven’t visited Orange Beach you are missing out! Beach Weddings Alabama has an amazing venue location in Orange Beach for you to have a unique and truly special wedding. 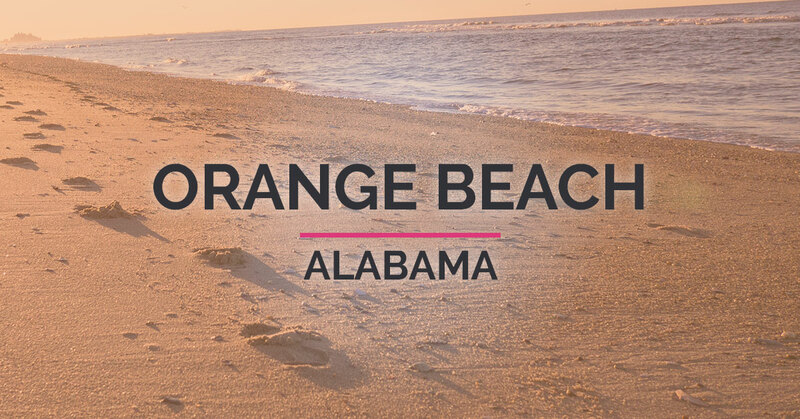 Read on to find out more about Orange Beach and why it makes the perfect wedding destination! Maybe Florida or California pop into your mind when you think of a gorgeous beach, but you should add Alabama to that list! Families and couples return to Orange Beach year after year because of the beautiful beaches! Alabama has 32 miles of white sand beaches that are made from quartz grains washed down from the Appalachian Mountains many years ago. The resulting sand is white, soft, and some even say it squeaks under your feet! There are many beaches to choose from in the United States, but some may be rocky, weedy, or made of coarse, uncomfortable sand. This is not the case in Alabama, where our miles of soft white sand bring back visitors year after year. Our beaches are wide and spacious, and not as crowded as the more popular beaches in heavy tourist areas. When you come to Orange Beach, you get to experience the hidden gem that is the Alabama gulf coast! The water on Orange Beach is clear, blue, and warm. These gulf waters, with their mild temperatures and gentle waves, are beautiful for swimming in, splashing in, or just taking in from a beach chair. If you are looking for a beach that will provide your wedding with a backdrop of gentle waves and beautiful scenery, Orange Beach is your perfect destination! Your wedding guests will love that you chose a spot that is not only breathtaking, but also has a beach with waters that can really be enjoyed. Our beaches are great for playing in! If you love warm weather in the day and mild weather at night, Alabama beaches are for you! Alabama is in the subtropical area of the country, and the Gulf breezes temper the hot summer days and keep Orange Beach the perfect temperature much of the year. Average temperatures in the summer months are in the low 80s, making for a wonderful wedding venue. Rains are usually not a problem, and scheduling your wedding earlier in the day can usually help to avoid any potential storms. The weather in Orange Beach is just another reason that the Alabama shores make for the perfect wedding venue! A sunset makes for a dramatic and unforgettable backdrop to any wedding. The sunsets in Orange Beach are incredible, and it can be hard to choose which is more beautiful: the sunny, blue-skied days, or the dusky, pink and orange hues of the evening hours. If you are looking for a beach with the potential of a great sunset, Orange Beach is the destination wedding venue for you. Of course, if you are coming to the Gulf shore for your beach wedding, your main focus will be the beach. However, it is just an added perk that the town and surrounding areas are so amazing! If you or your wedding guests are planning to stay in the area, there while be plenty to do. Hugh S. Branyon Backcountry Trail: If anyone in your wedding party loves the outdoors, this nearby trail is a treat. You will feel you are a world away as you wander through the diverse tropical foliage, watch birds fly overhead, and possibly even spot an alligator. Great for hiking or biking, this trail will take you through dunes, swamps, savannah and bluffs. The Wharf: The Wharf is a great destination for all ages, with restaurants, shops, and even a ferris wheel! There is also a free sound and light show that is spectacular and takes place almost every night in the summer. Adventure Island: If you have families with kids attending your wedding, they will be thrilled to visit Adventure Island! Here you will find go karts, bumper boats, laser tag, and more! As you can see, Orange Beach is a great destination for everyone! Your guests will be thrilled that you chose such a great venue for your wedding, and will probably want to make a longer vacation out of it! So if you are thinking about a beach wedding, and haven’t put Alabama’s beaches in the running, you are missing out! Orange Beach is a hidden gem on the Gulf coast that has white sand beaches, sparkling, clear blue waters, great temperatures and an amazing town. Beach Weddings Alabama wants to help you create your perfect beach wedding, and we offer all-inclusive packages that make it even easier! Discover the beauty of Orange Beach, and schedule a consultation with us today!